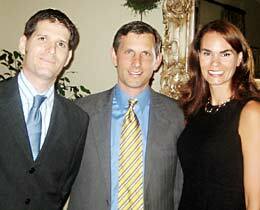 In September 2007, the Parca Auxiliary honored Cotchett, Pitre & McCarthy with "Parca's Angel Award". Cotchett, Pitre & McCarthy donated proceeds from a portion of unclaimed settlements left over from a class action lawsuit to Parca Organization, a private nonprofit association that serves people with developmental disabilities and their families in the Bay Area. This award was created for Cotchett, Pitre & McCarthy in recognition of the law firm's generous donation. Mark Molumphy and Neil Swartzberg accepted the award on behalf of Cotchett, Pitre & McCarthy. Molumphy expressed hope that other law firms and companies will be encouraged to give back to the community with this example.